Microcavities: Does Earliest Decay Need Filling? WATCH Will Technology Kill the Dread of Dentist Drills? By the time a dentist finds a cavity, that tooth has been through several stages of a chronic infectious disease called dental caries, where acids dissolve tooth enamel, letting bacteria inside. Unchecked, the tooth can die. 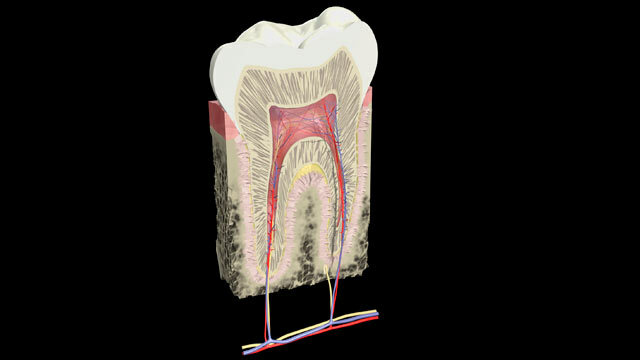 Dentistry today focuses on early intervention to prevent bacterial invasion of the dentin, a layer just inside the enamel, and the vital pulp. Laser scanning, fiber optics and fluorescent technologies have allowed dentists to better visualize weakened, decayed enamel before it becomes visible on an X-ray or to the naked eye. Some dentists say high-tech tools enable them to perform minimally invasive dentistry, which preserves more of the tooth, often by treating "incipient carious lesions," also called microcavities. These abnormalities begin as white spots, which can progress to dark, stained pits and fissures. Dentistry has evolved from "drill and fill" mechanics to a disease model focused on averting decay, supported by a 2001 National Institutes of Health consensus statement that identified a shift toward improving the diagnosis of early lesions and stopping their progression. However, this early treatment may -- but need not -- involve the good old dental drill. Some dentists want to fill all these little pits and flaws, sometimes warning of cavities to come, perhaps leading to a dreaded root canal, or losing the tooth. "Some dentists may honestly believe they're doing a patient a favor by treating early," said Dr. James C. Hamilton, now retired from the University of Michigan dental school. "Some dentists would convince patients caries is like cancer. 'Do you want me to leave a little cancer in your mouth? No.'" Hamilton led a five-year study that found early treatment of microcavities using an air drill (less painful than a traditional drill) and a composite filling failed to conserve more of the tooth than watchful waiting until caries were diagnosed. "We found no benefit at any time for early treatment," Hamilton said in an interview Thursday. He worries that expensive equipment pushes some dentists toward more aggressive treatment to get a "return on their investment." "When you buy this new technology to treat incipient carious lesions, you have increased your overhead. You now have to make this piece of equipment pay for itself," Hamilton said. With the cost of a filling ranging from about $100 to $250, dentists might be "using this to find and treat those lesions when in fact they ought to be just watching them," he said. Patients may balk at what they perceive as overzealous dentists proposing unnecessary and costly filling of microcavities before they've eaten into the dentin. That's why they should ask for a second opinion as they would for a medical issue, said Dr. Irwin Mindell. His mid-town Manhattan dental practice is very conservative and often proposes "watchful waiting" for microcavities. "We have a very aggressive recall system. It's not that if you don't do it now, chances are you aren't going to come back to the dentist for another three years and at that time, we have another major problem," Mindell said. "I know I'm going to see the patient six months hence." Mindell, who has been in practice since the 1950s, said that if damage hasn't reached the dentin, "you don't treat, because it may take years and years and years to become something. A lot of stuff never goes any further." For patients who aren't prone to cavities, removing the compromised enamel could lead to "greater loss of tooth than what the decay process will do." But there's also a third way, said Dr. Peter Arsenault, a clinical professor at the Tufts University dental school in Boston. "Does treating mean drilling? Not in my eyes. That's what carpenters do," he said. For the appropriate patient, Arsenault proposes a treatment plan that requires "a lot of dedication and a lot of education." It relies on neutralizing acidity in the mouth with frequent use of pH-boosting sprays and drops; killing mouth bacteria with xylitol--a sugar alcohol derived from birch trees, and using re-mineralizing toothpastes that stabilize and shore up weakened enamel. Arsenault teaches dental students and dental colleagues the Caries Management by Risk Assessment (CAMBRA) approach, which uses a patient's history of cavities and dental work, oral hygiene habits and consumption of acid-promoting sugary foods, among other factors, to categorize them as low-risk, moderate-risk or high-risk for developing cavities. "For each level of risk, there's a bit of an art, and a bit of science to it," Arsenault said Thursday. He described a low-risk, highly motivated patient who came to him a year ago with four small spots in her dental enamel and conscientiously adhered to the recommended treatments. When he examined her teeth earlier this week, the spots had shrunk. "She's thrilled I didn't have to drill this tooth," he said. Arsenault first learned about CAMBRA at an NYU conference four years ago, where he said that at first, "it sounded like hogwash." But he was quickly won over and brought CAMBRA to Tufts. "We're showing with low-risk patients we can slow down, freeze and reverse" the caries process, he said. With extreme-risk patients, they can fill decayed teeth with materials that release fluoride to safeguard the other teeth. CAMBRA is now being taught at dental schools. Although the American Dental Association supports a risk assessment approach to dentistry, it hasn't yet taken a position on treating microcavities. "Evidence-based things are slow-moving," Arsenault said. "It's a momentum thing. It's on its way. We're getting closer." +Are Your Dental Fillings Safe?